Due to Typhoon Glenda, UPLB servers are still down at the moment so users will not be able to login to OrgsUP and the OSAM System using their SystemOne accounts. A lot of places in Los Baños still do not have power supply and Internet access too. Since we do not want to move the Campus Tour volunteer registration again, we have decided to open the registration via SMS. Using the mobile numbers registered by students in OrgsUP/OSAM System, students will be able to sign up by texting CAMPUSTOUR to 09176923500 starting at 9PM today (July 24, 2014). To give everyone a chance to sign up, 140 slots will be opened each day at 9PM until July 26, 2014. A total of 420 volunteers may sign up. NOTE: Please allot up to 10 minutes for a reply from OSA. Text only once. You may be blocked by the system automatically if you flood the OSA mobile gateway. SystemOne is now online. Registration via SMS has been disabled. To volunteer, login to www.soadosa.org, go to My Forms -> Campus Tour Volunteer Registration. August 7, 2014 (Thursday) 2:30 PM Campus Tour Volunteer Briefing at Makiling Ballroom Hall. Attendance is REQUIRED for all volunteers. Waitlisted volunteers are highly encouraged to attend. August 11, 2014 (Monday) 5:30 AM AlmOSAlan. Campus Tour volunteers will be invited to volunteer to assist during the AlmOSAlan event for New Freshman on July 28-30. Students will receive an SMS invitation. This is different from almOSAlan org registration. What if my mobile number is not registered? You will not be able to register via SMS. This is the reason why we regularly ask students to update their OSAM profiles - mobile services are available which requires earlier registration through the OSAM System. All UPLB students (at least sophomore standing) planning to enroll on First Semester AY 2014-2015 who have OSAM profiles. Campus Tour volunteer registration is only open through SMS because UPLB servers are still down. Thus, users will not be able to login using their SystemOne accounts. July 26 Update: You can sign up online at www.soadosa.org. Can I sign up for my whole organization? But I have a temporary OSAM account so I can login to OSAM. Can I sign up online? To be fair with everyone, there is only one registration process for the Campus Tour volunteer registration which is through SMS. I am free on August 10 (Campus Tour) but not on August 7 (Briefing). Can I sign up? No. The attendance to the Campus Tour briefing is required. How do I sign up via SMS? 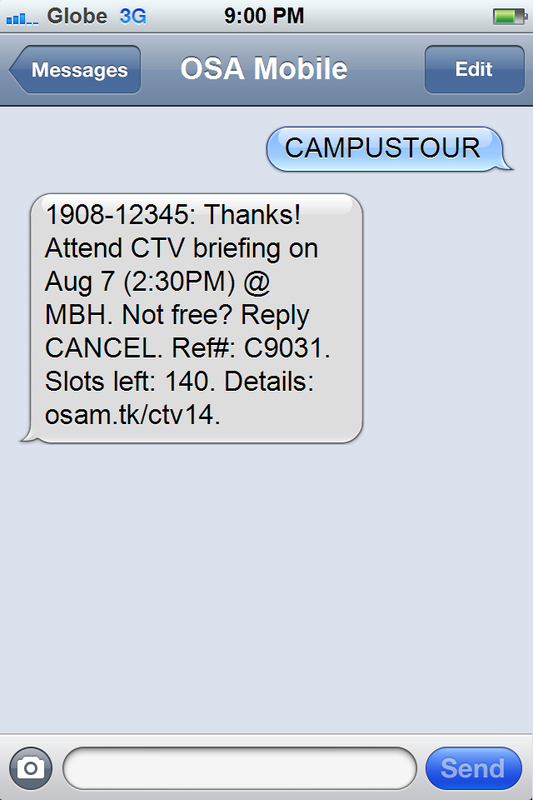 As indicated above, you should text CAMPUSTOUR to 09176923500. This works for any mobile network. Please wait for up to 10 minutes for a reply. July 26 Update: You can only sign up online at www.soadosa.org. Can I sign up using any mobile number? No. You can only use your mobile number registered in your OSAM profile. How do I know if I was able to sign up successfully? You will receive a confirmation message with a reference number. What if I decide to withdraw my registration? Just text BACKOUT to 09176923500.July 26 Update: Visit the registration page at www.soadosa.org. What happens if my registration is canceled? During the first two days of registration, this will free up a slot and would allow another student to sign up. During the last day of the registration, the freed up slot will be given to the next student in the waitlist. How do I check the status of my registration? When you sign up, you will receive a confirmation message. If you are in the waitlist, you can text CTVW to 09176923500 to check your waitlist rank. The waitlist feature is only available on the last day of registration. July 26 Update: Visit the registration page at www.soadosa.org. Can I sign up for another person? Yes, as long as you use his/her mobile number to send the text message. Slot hoarding is not possible and volunteer slots are non-transferrable. Another student was able to sign up after the system told me there were no more slots! How did that happen? A student may have canceled his/her registration. When the student canceled his/her registration, this "another student" was able to sign up. After I register, what do I need to do? Attend the Campus Tour briefing on time. The briefing is on Aug. 7 (2:30 PM) at Makiling Ballroom Hall, 2/ F Student Union Building. If I sign up and do not show up, what will happen? You will be preventing other willing UPLB students to assist during the Campus Tour. We'll frown upon you and also put a record in your student profile regarding your absence. If you will not be available, please text BACKOUT to 09176923500 to give others a chance. July 26 Update: Registration may be canceled online at www.soadosa.org. Until when can I cancel my registration? Students will be able to cancel their registration until July 30. If I have a valid reason, can I cancel my registration after July 30? Yes, just drop by SOAD. But please remember not to sign up if you are not yet sure of your availability. If I am in the waitlist, what is the possibility that I will be accommodated? Since the waitlist only contains 30 students, the chances are high that you will be accommodated because there will be students who will cancel their registration. Some students do not show up during the briefing so we encourage you to still attend the briefing on Aug. 7. If you have any other questions, please feel free to post them below. We cannot guarantee an immediate reply especially because there is still no power and Internet in the University.